The Week in iOS Accessories, part 2: Oh, baby! The Week in iOS Accessories: Power to the people! Yesterday we took a look at accessories for the new iPad. In this week's second roundup of new accessories, we focus on products designed for all iOS devices. We cover accessories to help you make movies, listen to your baby, or enjoy great music. Calypso: Day-oh! 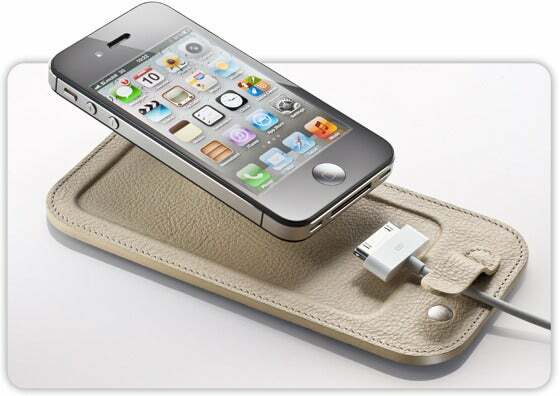 The $39 Calpyso is akin to a cross between a fine-leather iPhone case and a desktop docking port for your device. Put simply, it's an attractive desktop pad, custom-fit for an iPhone 4 or 4S, that keeps your iPhone's charge/sync cable handy (and from falling behind your desk or nightstand). The promotional materials for the Calypso line repeatedly emphasize its use of fine Italian leather, which reminds us a lot of Ricardo Montalban. Flygrip: Even the iPhone can sometimes be a chore to hold and view. The $30 Flygrip series of phone holders eases the burden while adding a dash of color to your device. The Flygrip looks and acts a bit like a big, plastic, paper binder clip—it attaches to the back of your phone to make a convenient holder, or can prop up your iOS device for hands-free viewing. The accessory comes in seven different colors. Nocs: You can use AirPlay to wirelessly stream music from your iPad, iPhone, iPod touch, or Mac to Nocs' $400 NS2 Air Monitors speaker system. The speakers use with 3-inch kevlar woofers and provide 70 watts of power. At just 6.6 pounds you could carry them around, but they're oriented toward shelf or desktop use. Scosche: This company is always coming up with new products, and this week it offers up a series of chargers for iOS devices. Scosche's new ReVolt Pro C2 is built for the car; the ReVolt Pro H2 is made for the home. Both are USB chargers that include a USB-to-dock-connector cable. The ReCoil II is a car charger with a handy—and clutter-reducing—retractable cable. Scosche hasn't announced when the chargers will be available for sale or how much each will cost. 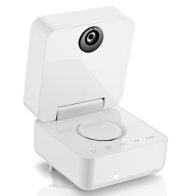 Swivl: We told you about this cool product when it appeared at January's Consumer Electronics Show, but the $180 Swivl is now available for shipping. The device enables video creation by giving your phone a mount for hands-free recording, but it goes a step or two beyond that. Attach a special marker to your subject, and the Swivl, well, swivels on its base to follow the subject during video recording. (You'll need the free Swivl app to make the system work.) The Swivl lets you position your iPhone in horizontal or vertical orientation; it also can be used with any tripod-mountable pocket camera. Withings: This company is always coming up with new iOS-centric ways to raise your child right—remember the Smart Baby Scale? Now Withings is offering new parents the $299 Smart Baby Monitor, a music-box-shaped device that can send video and audio to your iPhone for round-the-clock monitoring. The device offers infared vision for late-night viewing, and the system can detect movements and noise in your baby's room, sending a push notification to your iOS device when these events happen. The Monitor even includes a loudspeaker for talking and singing to your baby from the other side of the house.